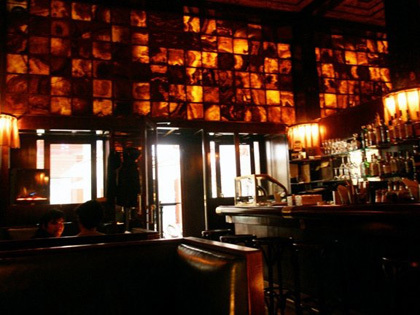 When walking into the bar from the bright outdoors, the dark interior creates a complete loss of physical bearing. The mirrored and amber cubed interior reflects and refracts space and light infinitely, further upsetting an understanding of physical space, and when drinks are added to the mix, you find yourself dangling in a hazy, dusky environment removed from the busy urban reality. You have thrown yourself from the alertness of day into the dreamy perception and autumnal hues of twilight. It embodies the blissed-out, leisurely, decline of the day.